In 2000 and 2001 the Zetas explained that chemtrails were an experiement by the wealthy to determine how well poisoning a migrating populace from the air might work. The ultimate agenda was to eliminate hoardes after the pole shift, and to use the military to do so. But when the millitary discovered this, they rebelled. Contrails are an experiment of the wealthy and powerful, to see how much deliberate infection of the wandering masses might slow them down. This has been allowed, where practiced, because the experiment was couched in terms of crowd control. Those allowing this to continue, the military and national security groups, were assured that only temporary illness would occur. However, the intent of the elite was scarcely temporary illness. Imagine elite groups settling into North Carolina estates, or in valleys in Utah, or in Wyoming. Why would they want masses of the lower class, starving and angry, invading their communities? There would certainly not be food or supplies enough to go around, and these elite do not think of the populace as anything on an equal basis to themselves. Their logic is that if these starving hordes are to die anyway, the sooner the better! Beginning in the year 2000, the patterns of chemtrails had created an alarm in the populace to the extent that public outcry was becoming organized and vociferous. Rally's were being held, petitions signed, and documentation on harm to children and other vulnerable segments of the population showing that the tests being run were not as harmless as claimed. Those in the government aware of the chemtrail tests had been assured that no harm would come to the populace - a slight increase in flu symptoms, a few days lost at work or school, but all in all, relatively minor complaints. That the threshold putting a sick child or oldster from the sick bed into the coffin was occurring set those among the wealthy and powerful elite at odds with each other, and behind the scenes wars over allowing the chemtrail tests to continue broke out, unseen to the public eye but nonetheless fierce. 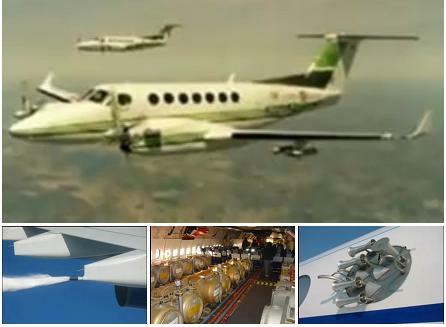 Recently photos ohave been leaked to the public showing that small planes, not military plans, are used to spread contrails. This is indeed a project carried out by the wealthy. Per the Zetas, this project now is being conducted to fog up the skies to the Planet X complex cannot be seen by the public. We have mentioned that chemtrails originally had the purpose of testing how well humans in the flight path could resist various microbes and chemicals that would sicken them. The point was to delay them as they attempted to migrate toward enclaves of the wealthy, for instance, to sicken those leaving LA and trying to reach Utah. Behind these tests was a more sinister purpose, to poison and kill the migrants. When the US military discovered the plan, being openly discussed at times in the back rooms of the White House, they rebelled and refused to have any part of chemtrail activity in the future. Where the campaign was being conducted by the wealthy, their plan was to use the US military when the time came, and without the cooperation of the US military, this plan could not succeed. Thereafter, chemtrails were used to fog up the view of Planet X. In some cases, tests were done to determine where the drift would go, where the chemtrails were pushed by the prevailing westerlies. Since sunrise and sunset are the danger times when Planet X might be sighted, these are the main fogging target times.